On its face, pinball is a relatively easy game. Each player spends three rounds using (at least) two flippers to send a silver ball up a series of ramps, into holes, around curves, through spinners, and inside targets to accumulate points. That’s the kindergarten-level summary. Pinball is, in actuality, a deceptively complex, sometimes maddening pastime. And no city is more associated with the classic arcade game than Chicago. Here, more than 200 locations (many of them bars) currently host some 520 machines, according to pinballmap.com -- most of which were made just miles away in the Chicago suburbs. Serious pinballers tend to visit these bars on weeknights, or during the day on weekends before a more traditional crowd arrives. But even for pinball novices, the game is a low-maintenance, high-energy alternative to a typical night out. Yes, it’s safe to call pinball Chicago’s best-loved bar game. In this city, there are multiple arcade bars, league nights flourish, and playing a round on a machine could see you brush shoulders with a game engineer. Which is all to say that pinball culture in Chicago is unlike anywhere else. In the early 2000s, Chicago pinball was essentially limited to two outlets: corner bars with one or two choices, or dedicated hobbyists with a basement full of machines. But 2012 saw the rise of the so-called “beercade” in Chicago. 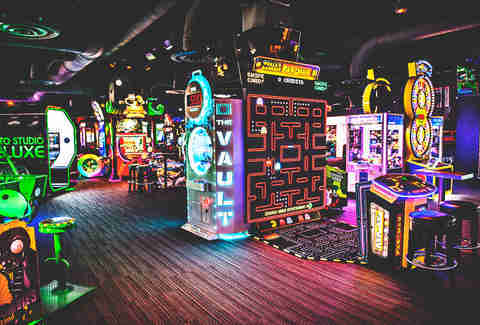 (Though Zespy hates the portmanteau; “We’re an arcade that serves beer, or we’re an extreme bar with games,” he says.) The deluge began with Emporium Wicker Park and Headquarters Lakeview (now Replay Lincoln Park) that summer, followed by Logan Arcade, Headquarters River North and Emporium Logan Square in 2014. 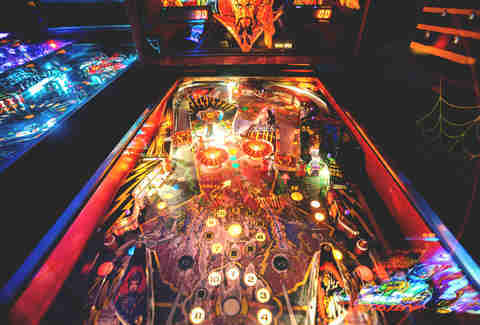 While a handful of other arcade bars have opened throughout the city since (including FTW Chicago, Uptown Arcade), the aforementioned five spots are a great starting place for a new pinball enthusiast. Both Emporiums, as well as the Fulton Market location that opened in 2017, feature large open spaces, great for group gatherings or parties, and more than a dozen machines. 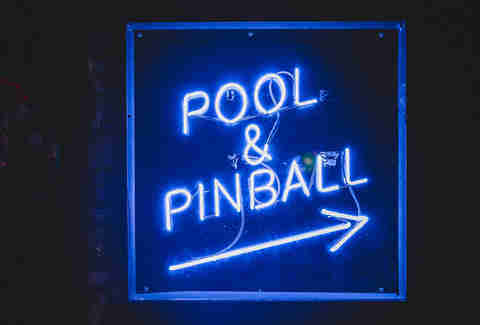 The Logan Square offshoot has 80-plus craft beers, a sometimes-open indoor food truck (past tenants have included Mexican sandwich shop Cemitas Puebla and Filipino fusion concept Hapa Chicago), as well as six pool tables, bubble hockey, air hockey, and vintage bowling games. The full stage at the Wicker Park location hosts concerts, cosplay events, movies, and more, and their bar offers 24 beers on tap and more than 40 different types of bourbon. At Fulton Market, you get a summer patio (with corn hole set-up), plus it's the only location with a craft cocktail program. All games are on free play at Replay and Headquarters, so both are a great place to get in practice. Replay counts 14 pinball machines, a craft cocktail menu with inventive options like the Irish Goodbye (Jameson, Ancho Reyes chile liqueur, NOLA coffee liqueur, nitro cold brew coffee, cinnamon stick) and the Violet Crime (which includes a double shot of Stoli Blueberry, homemade blueberry syrup, and a Blueberry Red Bull ice cube) as well as rotating art themes that have included Simpsons and Rick and Morty-themed pop-ups. The decor at Headquarters is a two-story trip back to the ’80s: Vintage microphones serve as beer tap handles, cassette tapes line the walls of one nook, and old-style TVs are displayed behind the bar. Headquarters is also the only arcade bar in this group to offer a full food menu (though the others welcome outside food) including occasional themed Sunday brunches around concepts like Disney Sing-a-Long and '90s Nickelodeon. Regular menu items include a half-pound of wings for $14 (but keep those sticky fingers off the machines!) and a variety of “handhelds” like the Mamma-Mia Burger (Italian sausage, beef, fresh mozzarella, marinara) and the French Onion Grilled Cheese Sandwich (caramelized onion & gruyere, sliced steak optional). At Logan, which has the largest public collection of pinball machines in Chicago, the 20 beers on draft include regional picks from Chicago's Off Color Brewing and Half Acre Beer Company, Warrenville's Two Brothers Brewing Company (including the aptly-named Pinball American pale ale), as well as hard cider from West Michigan-based Vander Mill. Last year, the bar melded its Halloween and winter holiday decorations into a big mess of plastic pumpkins, Santa Clauses, and glowing masks. It’s the kind of chaos that feels like home, especially during Tuesday’s magician night and the bar’s monthly Night Names queer dance party. Pinball wasn't always the kind of pastime you could build a night out around, however. The game was cited as a form of gambling and barred throughout much of the US for more than three decades -- putting a damper on Chicago's burgeoning industry. 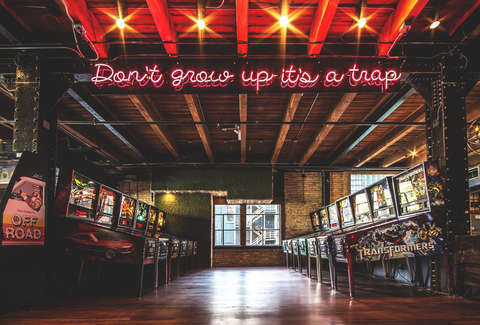 Because as it turns out, the same resources that made the city a boom town for meatpacking and other manufacturing trades in the early 1900s also made it ripe to be the world headquarters of pinball. With the vast availability of lumber, wiring, and steel from nearby Gary, Indiana, as well as a factory-ready workforce, early pinball titans David Gottlieb and Harry Williams had all the resources they needed to launch their empires in the 1930s. The region’s railroads, rivers, and Lake Michigan ports meant the machines could find their way to new corners of the country. After the Illinois Supreme Court ruled pinball machines a "mechanical gambling device" in 1942 (New York City issued a similar decree the same year), area manufacturers Gottlieb, Williams, Stern, and Bally’s continued quietly cranking out newer and better games under the radar until Chicago’s ban was overturned in early 1977. Those companies were now free to push the business to its limits, and enjoyed a several-decades heyday throughout the country and in Chicago at spots like the now-defunct Dennis’ Place for Games. “When the arcade industry really boomed in the ’80s, it was something you couldn’t do at home,” says Charlie Emery, president and co-founder of Spooky Pinball. But home video game consoles were becoming cheaper and more impressive; by 2000, only one company remained: Stern (operating in Elk Grove Village, Illinois), who would be the lone producer of physical pinball machines for the next decade. It wasn’t until 2011 that a new manufacturer, Spooky Pinball, was born out of Benton, Wisconsin, about 170 miles from Chicago, and (along with the rise of arcade bars) helped breathe new life into the pastime. Its most popular game, Total Nuclear Annihilation, launched last July and has sold about 430 units to date -- in fact selling faster than the small-time operation can build it. The plethora of places to play has created a whole new kind of Chicago pinball player and culture, including Pinball Chicago, a team-based league founded in 2014, and Belles and Chimes, a league for female-identifying players started in Oakland, California, which launched a Chicago chapter in 2017. For those less experienced players who don’t know a drop target from a scoop shot, here’s a word of advice on how not to be good at pinball: Plunge the ball as hard as possible, then whack both flippers at the same time. That’s a surefire way to elicit head-smacks from the more seasoned players around you. The truth lies somewhere in the middle. Every pinball machine has a straightforward set of rules, which is almost always displayed on the bottom left-hand corner of the playfield. It helps to verse yourself in pinball vocabulary and basics, or for those looking to learn a game intimately, the Professional & Amateur Pinball Association provides video tutorials to individual machines. She and Emery (who admittedly may be a little biased) also named Spooky’s TNA as another great starter machine (find it at Logan Arcade, Bigby’s Pour House in Rolling Meadows or Brixie’s Bar & Grill in Brookfield). The game seems almost too simple at first glance; there are no ramps, and no cartoonish characters. But it’s perhaps the best example of one of the genre’s most important tenets, and, along with the community aspect, what makes pinball Chicago’s best bar game: Simple does not mean easy.